On the eve of Independence Day, we set on a long road trip to a really unique destination in the northern Western Ghats called Naneghat. Naneghat literally means Coin-passage. It has an interesting history behind the name. It was used as a trading route centuries ago between Kalyan and Junnar. In those times, coins were collected as toll to cross via the pass, and hence the name. An aerial view of Naneghat gives a fantastic look at its geography. It is a fascinating landmark in the northern Western Ghats well known throughout the history. But that’s not it. Naneghat was a passage not only for our ancestors, but many, many other creatures small and large that could not tread the sheer drop from the plateau. ﻿We reached the base of the fort much after the expected time, had a cup of chai and proceeded to conquer this big bully. There is another fort called Visapur to the east of Lohagad. One the same mountain is a cave system called Baja Caves. 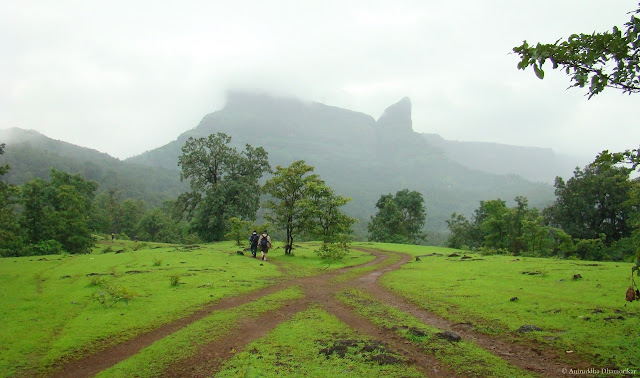 All the three locations are sought after by trekkers, but Lohagad… is a different case.